Are Nuts Good for Losing Weight? Because nuts contain rich amounts of fat, you may assume you need to stay away from them while following a weight-loss diet. To the contrary, you can make nuts a part of your diet and still lose weight. In fact, data suggests that incorporating nuts into your diet may provide weight-loss benefits. Whether you choose almond, Brazil, cashew, hazelnut, macadamia, pecan, pistachio or walnut, make nuts a part of your healthy diet. Nuts have a satiating affect, according to a review of studies published in the "Asian Pacific Journal of Clinical Nutrition" in 2010. This may be attributed to their fiber content. When you feel full for longer, you eat fewer calories, which helps promote weight loss. Feeling satiated also means that you'll find it easier to adhere to a calorie-restricted diet. One of the drawbacks of lower-calorie diets is persistent hunger, so snacking on nuts can help combat that. One study reviewed in the "Asian Pacific Journal of Clinical Nutrition" showed that regular consumption of peanuts for 19 weeks resulted in an 11 percent increase in resting energy expenditure, or REE. REE refers to how many calories you burn at rest. The exact mechanism remains unknown. However, the journal authors theorize that the high unsaturated fat content combined with the rich protein concentration may exert a thermogenic effect. This refers to an increase in body heat through metabolic stimulation. They point to a trial showing that walnuts boosted thermogenesis, compared with a meal featuring saturated fat from dairy. Nuts have a low-glycemic load, which means that they cause a gradual rise in blood sugar, instead of an abrupt increase. Foods with a low-glycemic load keep blood sugar stable. In overweight people, following a low-glycemic load diet led to a significant increase in fat loss compared to a traditional weight- loss diet, the journal authors reported. Eating low-glycemic-load foods also led to a significant decrease in body mass index, or BMI, according to the review. BMI is a number frequently used to estimate body fat. Nuts contain a mixture of fats, most of which are beneficial monounsaturated fat. They also provide protein, vitamins and minerals, including calcium, magnesium, potassium, iron and vitamin E. A handful a day is all you need, because nuts are calorie-dense. 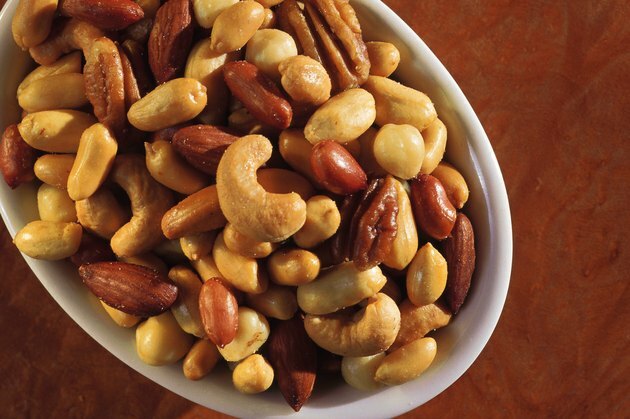 A 1-ounce serving of nuts contains between 160 to 200 calories. As an example, 1 ounce equals 12 hazelnuts or macadamia nuts, 15 pecan halves, 18 medium cashews or 24 almonds. A convenient way to incorporate nuts into your diet is to add a handful as a snack between meals.